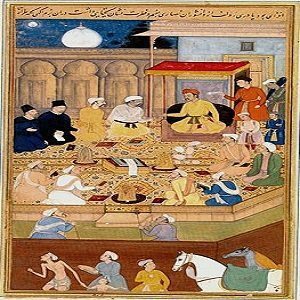 Akbar and the Half-Reward-Akbar Birbal Stories. Akbar gives a reward to Mahesh Das who saved him but someone else demands half. A young man named Mahesh lived in a hut nearby. He heard a call coming deep from the woods, and he ran to the place. You can be sure the Emperor was glad to see him! Safe home at last, the Emperor said, “Young man, I want to give you a gift.” He took a ring of emerald and gold from his finger. And he gave the ring to Mahesh. “But I have come to see him,” said Mahesh. “And the Emperor knows me.” He showed the guard the fine ring the Emperor Akbar had given him. The guard said to Mahesh, “Listen, I will let you inside. But any gift you get from the Emperor, I must get half.” The guard crossed his arms. “That’s the deal,” he said. "Take it or leave it." What could Mahesh do? So he agreed. The guard let him into the palace, and showed him to the royal room of Emperor Akbar. “My young friend in the woods!” called Emperor Akbar when he saw Mahesh. “I am very glad you came back. Now I can give you another gift. What would you like from the Emperor of Hindustan?" "Your Majesty!” said Mahesh with a bow. “I would like 50 lashes." “I will tell you after the lashes,” said Mahesh. So the king’s men started to whip him, as he had said. But after the 25th lash, Mahesh asked the Emperor to call the guard who was standing outside the room. But to his surprise, Mahesh pointed to him. He said, “My Emperor! This guard let me inside the palace only if I agreed to pay him half of any reward I may get from you. I always keep my promises. So please, give him the 25 lashes that are left." The Emperor ordered that the guard be given 25 lashes, along with 5 years in prison. Emperor Akbar was more pleased than ever with Mahesh. He invited the young man to stay at the palace and serve as his royal advisor. And there Mahesh served for many long years.